Khadi Vitalising Hair Oil is the most popular version of the oil from this brand due to its properties. Responsible for it is the complex of natural vegetable oils. To be precise: sesame oil, amla oil, coconut oil, castor oil, bringaraj oil, brahmi oil, bala oil, carrot seed oil, rosemary oil and watermelon seed oil. Its precious properties for hair growth stimulation are a merit of many vegetable extracts, among many fenugreek and butea flowers extract. Multitude of oils and natural extracts is one thing and lack of any harmful substances is the other. It is worth to highlight fact that formula of Khadi Pure Ayurvedic Hair Oil is entirely natural. Hair growth enhancing Khadi Vitalising Oil is much more frequently chosen by women than its sister version Khadi Amla. Both products are great for hair growth enhancement, but Vitalising Hair Oil consists of much more extracts and additional oils. This is why its properties are far better. Hair Oil stimulates hair growth and prevents hair loss. This is an amazing treatment against hair loss, because it strengthens them and regenerates from the inside out. Hair growth stimulating oil from Khadi not only provides length and strengthens hair, but also ensures gloss, elasticity and protection, e.g. against skin infections or fungal inflammations leading to dandruff. Characteristic feature of all oils from Khadi is their aroma. 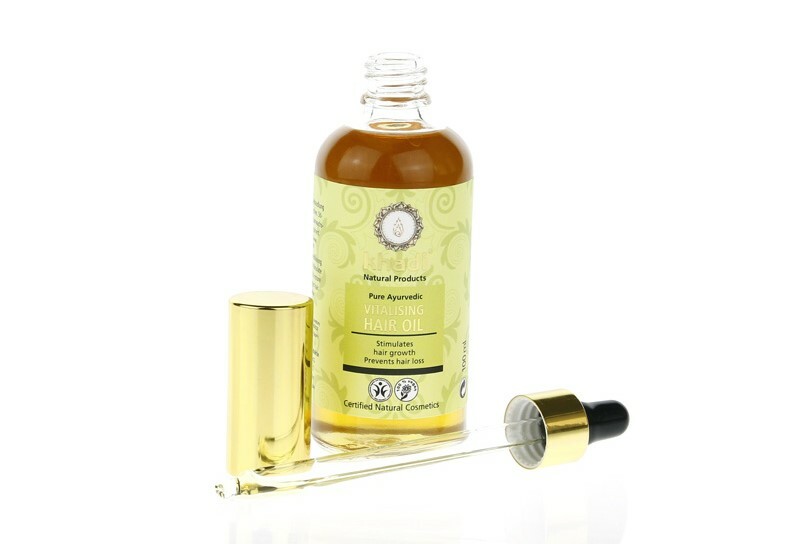 Also Pure Ayurvedic Vitalising Hair Oil has specific, intense, very exotic smell. Depending on the taste you may like it or not. Certainly, it is worth to know that this scent stays on hair for quite some time after use. Stimulating hair growth oil, Khadi, delights with the colour – yellow gold. The consistency can be troublesome when it comes to application, because oil is quite runny. Luckily, Khadi equipped its product with precise pipette, which not only makes application of oil on hair easier, but also increases its efficiency. The packaging is elegant, but made of glass, so you must firmly hold it in hand. Khadi Pure Ayurvedic Vitalising Hair Oil is perfect for hair oil treatment due to lack of harmful substances. Its formula absorbs fast with no sensation of stickiness.